Adults have tiny, almost unnoticeable toe pads; a dark line extends from the snout through the eye to the groin. Basic coloration varies, with background color green, brown, gray, or reddish. Typically three to five dark longitudinal stripes are present on the head and back; in some individuals the stripes may be broken into spots. Adult body length is 0.75 to 1.5 inches. Eggs and tadpoles: eggs are laid in clusters of 20 to 100; clusters are usually less than 1 inch across and attached to submerged vegetation. Tadpoles are brown/bronze with eyes located on the sides of the head. Can undertake movements of several kilometers between upland foraging and overwintering areas and breeding ponds. Boreal Chorus Frogs are regularly found in the water only during the breeding period in spring. They announce their presence this time of year by calling frequently at night and sporadically during the day. Following breeding, they move into adjacent uplands and are rarely seen. In eastern Montana, they breed in temporary ponds and small lakes surrounded by prairie (or occasionally open forest) habitats. Eggs hatch in about 2 weeks and tadpoles take 8 weeks to metamorphose. Inhabits marshes, ponds, small lakes in all life zones including lower alpine (Baxter and Stone 1980). When not breeding, generally found in damp grassy/marshy areas or damp forests near water, but has been found up to 0.5 km from water (Nussbaum et al. 1983, Hammerson 1982). Calculating the percentage of observations associated with each ecological system relative to the percent of Montana covered by each ecological system to get a measure of "observations versus availability of habitat". Species that breed in Montana were only evaluated for breeding habitat use, species that only overwinter in Montana were only evaluated for overwintering habitat use, and species that only migrate through Montana were only evaluated for migratory habitat use. In general, species were listed as associated with an ecological system if structural characteristics of used habitat documented in the literature were present in the ecological system or large numbers of point observations were associated with the ecological system. However, species were not listed as associated with an ecological system if there was no support in the literature for use of structural characteristics in an ecological system, even if point observations were associated with that system. Common versus occasional association with an ecological system was assigned based on the degree to which the structural characteristics of an ecological system matched the preferred structural habitat characteristics for each species as represented in scientific literature. The percentage of observations associated with each ecological system relative to the percent of Montana covered by each ecological system was also used to guide assignment of common versus occasional association. If you have any questions or comments on species associations with ecological systems, please contact the Montana Natural Heritage Program's Senior Zoologist. Species associations with ecological systems should be used to generate potential lists of species that may occupy broader landscapes for the purposes of landscape-level planning. These potential lists of species should not be used in place of documented occurrences of species (this information can be requested at: http://mtnhp.org/requests/default.asp) or systematic surveys for species and evaluations of habitat at a local site level by trained biologists. Users of this information should be aware that the land cover data used to generate species associations is based on imagery from the late 1990s and early 2000s and was only intended to be used at broader landscape scales. Land cover mapping accuracy is particularly problematic when the systems occur as small patches or where the land cover types have been altered over the past decade. Thus, particular caution should be used when using the associations in assessments of smaller areas (e.g., evaluations of public land survey sections). Finally, although a species may be associated with a particular ecological system within its known geographic range, portions of that ecological system may occur outside of the species' known geographic range. Adams, R.A. 2003. Bats of the Rocky Mountain West; natural history, ecology, and conservation. Boulder, CO: University Press of Colorado. 289 p.
Dobkin, D. S. 1992. Neotropical migrant land birds in the Northern Rockies and Great Plains. USDA Forest Service, Northern Region. Publication No. R1-93-34. Missoula, MT. Foresman, K.R. 2012. Mammals of Montana. Second edition. Mountain Press Publishing, Missoula, Montana. 429 pp. Hart, M.M., W.A. Williams, P.C. Thornton, K.P. McLaughlin, C.M. Tobalske, B.A. Maxell, D.P. Hendricks, C.R. Peterson, and R.L. Redmond. 1998. Montana atlas of terrestrial vertebrates. Montana Cooperative Wildlife Research Unit, University of Montana, Missoula, MT. 1302 p.
Hutto, R.L. and J.S. Young. 1999. Habitat relationships of landbirds in the Northern Region, USDA Forest Service, Rocky Mountain Research Station RMRS-GTR-32. 72 p.
Maxell, B.A. 2000. Management of Montana's amphibians: a review of factors that may present a risk to population viability and accounts on the identification, distribution, taxonomy, habitat use, natural history, and the status and conservation of individual species. Report to U.S. Forest Service Region 1. Missoula, MT: Wildlife Biology Program, University of Montana. 161 p.
Werner, J.K., B.A. Maxell, P. Hendricks, and D. Flath. 2004. Amphibians and reptiles of Montana. Missoula, MT: Mountain Press Publishing Company. 262 p.
Ants, spiders, flies, beetles, aphids and other insects (Nussbaum et al. 1983). Most common amphibian noted in north-central Montana. In high mountains, males may not breed until 2nd year, females at 3rd year. Survival to adulthood may be only around 1% in mountain populations (Hammerson 1982). Breed late March to early June in Wyoming (Hammerson 1982). Noted singing in early April in southwest ID and as late as early July (Nussbaum et al. 1983). Eggs hatch in 10 to 14 days and tadpoles metamorphose in about 2 months (Nussbaum et al. 1983). Metamorphosis observed late June to early August across eastern Montana (Mosimann and Rabb 1952). Baxter, G.T. and M.D. Stone. 1980. Amphibians and reptiles of Wyoming. Wyoming Game & Fish Department, Cheyenne. 137 pp. Hammerson, G.A. 1982. Amphibians and reptiles in Colorado. Colorado Division of Wildlife. Denver, CO. 131 pp. Mosimann, J.E. and G.B. Rabb. 1952. The herpetology of Tiber Reservoir Area, Montana. Copeia(1): 23-27. Nussbaum, R.A., E.D. Brodie, Jr. and R.M. Storm. 1983. Amphibians and reptiles of the Pacific Northwest. University of Idaho Press. Moscow, ID. 332 pp. [DCC] Decker Coal Company. 1998. 1997 Consolidated annual progress report. Decker Coal Company West, North and East Pits. Decker, MT. [EI] Econ Incorporated. 1984. Terrestrial wildlife inventory for the Lame Jones and Ismay coal lease tracts. Econ Incorporated. Helena, MT. [OEA] Olson Elliot and Associates Research. 1985. 1983-1984 Wildlife monitoring report for the CX Ranch project. Olson Elliot and Associates Research. Helena, MT. [PRESI] Powder River Eagle Studies Incorporated. 1998a. Big Sky Mine 1997 wildlife monitoring studies. Powder River Eagle Studies Incorporated. Gillete, WY. [PRESI] Powder River Eagle Studies Incorporated. 1998b. Spring Creek Mine 1997 wildlife monitoring studies. Powder River Eagle Studies Incorporated. Gillete, WY. [VTNWI] VTN Wyoming Incorporated. No Date. Second year's analysis of terrestrial wildlife on proposed mine access and railroad routes in southern Montana and northern Wyoming, March 1979 - February 1980. VTN Wyoming Incorporated. Sheridan, WY. 62 p.
[WESCO] Western Ecological Services Company. 1983a. Wildlife inventory of the Knowlton known recoverable coal resource area, Montana. Western Ecological Services Company, Novato, CA. 107 p.
[WESCO] Western Ecological Services Company. 1983b. Wildlife inventory of the Southwest Circle known recoverable coal resource area, Montana. Western Ecological Services Company, Novato, CA. 131 p.
[WESTECH] Western Technology and Engineering Incorporated. 1991. Update On the Wildlife Resources of the Little Rocky Mountains Environmental Study Area. Western Technology and Engineering, Inc., Helena, Mt. [WESTECH] Western Technology and Engineering Incorporated. 1998. Wildlife Monitoring Absaloka Mine Area 1997. Western Technology and Engineering, Inc., Helena, Mt. Atkinson, E.C. and M.L. Atkinson. 2004. Amphibian and reptile survey of the Ashland and Sioux of the Custer National Forest with special emphasis on the Three-Mile Stewardship Area:2002. Marmot's Edge Conservation. 22 p.
Bauer, D. 1997. 1997 wildlife study Savage Mine report. Knife River Corporation, Savage Mine. Richland County, MT. Bauer, Delane, 2002, 2002 Four Seasons Wildlife Study. Savage Mine Report, Richland County, Montana. Baxter, G.T. and M.D. Stone. 1985. Amphibians and reptiles of Wyoming. Second edition. Wyoming Game and Fish Department. Cheyenne, WY. 137 p.
Beal, M.D. 1951. The occurrence and seasonal activity of vertebrates in the Norris and Gibbon Geyser Basins of Yellowstone National Park. M.S. Thesis. Utah State Agricultural College. Logan, Utah. 61 pp. Benson, K.R. 1978. Herpetology of the Lewis and Clark expedition 1804-1806. Herpetological Review 9(3): 87-91. Bergeron, D. 1978. Terrestrial Wildlife Survey Coal creek Mine Area, Montana. Unpublished report for Coal Creek Mining Co., Ashland, Montana. Bergeron, D.J. 1978a. Terrestrial wildlife survey Divide Mine area, Montana 1977-1978. Western Technology and Engineering, Inc. Helena, MT. Bergeron, D.J. 1978b. Terrestrial wildlife survey P-M Mine area, Montana 1977-1978. Western Technology and Engineering, Inc. Helena, MT. Bergeron, D.J. 1979. Terrestrial wildlife survey, Coal Creek Mine area, Montana 1977-1978. Western Technology and Engineering, Inc. Helena, MT. Black, J.H., and A.N. Bragg. 1968. New additions to the herpetofauna of Montana. Herpetologica 24: 247. BLM. 1982b. Moorhead baseline inventory - wildlife. Bureau of Land Management, Miles City District Office. Miles City, MT. 29 pp. Bramblett, R.G., and A.V. Zale. 2002. Montana Prairie Riparian Native Species Report. Montana Cooperative Fishery Research Unit, Montana State University - Bozeman. Brunson, R.B. 1955. Check list of the amphibians and reptiles of Montana. Proceedings of the Montana Academy of Sciences 15: 27-29. Bureau of Indian Affairs, Department of the Interior. 1981. Draft Environmental Impact Statement. Unpublished report for the Crow/Shell Coal Lease, Crow Indian Reservation, Montana. Burton, S.R., D.A. Patla, and C.R. Peterson. 2002. Amphibians of Red Rock Lakes National Wildlife Refuge: occurrence, distribution, relative abundance, and habitat associations. Herpetology Laboratory, Department of Biological Sciences, Idaho State University, Pocatello, ID. 66 p.
Butts, T.W. 1997. Mountain Inc. wildlife monitoring Bull Mountains Mine No. 1, 1996. Western Technology and Engineering. Helena, MT. Confluence Consulting Inc. 2013. Montana Department of Transportation Wetland Mitigation Monitoring Reports (various sites). MDT Helena, MT. Cook, F.R. 1964a. Additional records and a correction of the type locality for the boreal chorus frog in northwestern Ontario. Canadian Field Naturalist 78: 186-192.
Cooper, S.V., C. Jean, and P. Hendricks. 2001. Biological survey of a prairie landscape in Montana's glaciated plains. Report to the Bureau of Land Management. Montana Natural Heritage Program, Helena, MT. 24 pp. plus appendices. Cope, E. D. 1879. A contribution to the zoology of Montana. American Naturalist 13(7): 432-441. Cope, E.D. 1872. Report on the recent reptiles and fishes of the survey, collected by Campbell Carrington and C.M. Dawes. pp. 467-469 In: F.V. Hayden, Preliminary report of the United States geological survey of Montana and portions of adjacent territories; being a fifth annual report of progress. 538 pp. 42nd Congress, 2nd Session, House Executive Document Number 326. Serial 1520. Cope, E.D. 1875. Check-list of North American Batrachia and Reptilia; with a systematic list of the higher groups, and an essay on geographical distribution. Based on the specimens contained in the U.S. National Museum. U.S. Natioanl Museum Bulletin 1: 1-104. Cope, E.D. 1889. The Batrachia of North America. Bulletin of the U.S. National Museum 34: 1-525, figs. 1-119, pls. 1-86. Corn, P.S. 1980. Comment on the occurrence of Pseudacris clarki in Montana. Bulletin of the Chicago Herpetological Society 15(3): 77-78. Corn, P.S. and E. Muths. 2004. Variable breeding phenology affects the exposure of amphibian embryos to ultraviolet radation. Ecology 83(11): 2958-2963. Corn, P.S., B.R. Hossack, E. Muths, D.A. Palta, C.R. Peterson, and A.L. Gallant. 2005. Status of amphibians on the Continental Divide: aurveys on a transect from Montana to Colorado, USA. Alytes 22(3-4):85-94. Corn, P.S., E. Muths, and W.M. Iko. 2000. A comparison in Colorado of three methods to monitor breeding amphibians. Northwestern Naturalist 81:22-30. Corn, P.S., M.L. Jennings, and E. Muths. 1997. Survey and assessment of amphibian populations in Rocky Mountain National Park. Northwest. Nat. 78:34-55. Coues, E. and H. Yarrow. 1878. Notes on the herpetology of Dakota and Montana. Bulletin of the U.S. Geological Geographic Survey of the Territories 4: 259-291. Crother, B.I. (ed.) 2008. Scientific and standard English names of amphibians and reptiles of North America north of Mexico. SSAR Herpetological Circular No. 37:1-84. Day, D. 1989. Montco Terrestrial Wildlife Monitoring Report. Unpublished report for Montco, Billings, Montana. Day, D., P.J. Farmer, and C.E. Farmer. 1989. Montco terrestrial wildlife monitoring report December, 1987 - July, 1989. Montco, Billings, MT, and Western Technology and Engineering, Inc. Helena, MT. Dood, A.R. 1980. Terry Badlands nongame survey and inventory final report. Montana Department of Fish, Wildlife, and Parks and Bureau of Land Management, Helena, MT. 70 pp. Durnin, K.B. and G.R. Smith. 2001. Effects of changing water volume on the tadpoles of two anuran species (Pseudacris triseriata and Rana blairi). Journal of Freshwater Ecology 16(3): 411-414. Econ, Inc. 1988. Wildlife monitoring report, 1987 field season, Big Sky Mine. March 1988. In Peabody Mining and Reclamation Plan Big Sky Mine Area B. Vol. 8, cont., Tab 10 - Wildlife Resources. Appendix 10-1, 1987 Annual Wildlife Report. Farmer, P. 1980. Terrestrial wildlife monitoring study, Pearl area, Montana June, 1978 - May, 1980. Western Technology and Engineering, Inc. Helena, MT. Farmer, P. J. 1980. Terrestrial Wildlife Monitoring Study, Pearl Area, Montana, June, 1978 - May, 1980. Tech. Rep. by WESTECH for Shell Oil Co.
Fjell, Alan K., 1986, Peabody Coal Company Big Sky Mine, Rosebud County, MT. Wildlife monitoring report: 1985 field season. March 1986. Fjell, Alan K., and Brian R. Mahan, compilers., 1984, Peabody Coal Company Big Sky Mine, Rosebud County, MT. Wildlife monitoring report: 1983 field season. February 1984. Fjell, Alan K., and Brian R. Mahan., 1983, Peabody Coal Company Big Sky Mine, Rosebud County, MT. Wildlife monitoring report: 1982 field season. May 1983. Fjell, Alan K., and Brian R. Mahan., 1985, Peabody Coal Company Big Sky Mine, Rosebud County, MT. Wildlife monitoring report: 1984 field season. February 1985. Fjell, Alan K., and Brian R. Mahan., 1987, Big Sky Mine, Rosebud County, MT. Wildlife monitoring report: 1986 field season. April 1987. Flath, D.L. 2002. Reptile and amphibian surveys in the Madison-Missouri River Corridor, Montana. Annual Progress Report. 14pp. Garber, C. S. 1992. A survey for spotted frogs (Rana pretiosa), wood frogs (Rana sylvatica), and boreal toads (Bufo boreas) in Wyoming. Wyoming Natural Diversity Database, Laramie. 15 pp. + appendix. Gates, M.T. 2005. Amphibian and reptile baseline survey: CX field study area Bighorn County, Montana. Report to Billings and Miles City Field Offices of Bureau of Land Management. Maxim Technologies, Billings, MT. 28pp + Appendices. Hammerson, G.A. 1999. Amphibians and reptiles in Colorado. University Press of Colorado & Colorado Division of Wildlife. Denver, CO. 484 p.
Hecnar, S.J. 1995. Acute and chronic toxicity of ammonium nitrate fertilizer to amphibians from southern Ontario. Environmental Toxicology and Chemistry 14(12): 2131-2137. Hendricks, P. 1999. Amphibian and reptile survey of the Bureau of Land Management Miles City District, Montana. Montana Natural Heritage Program, Helena, MT. 80 p.
Hendricks, P. 1999. Amphibian and reptile surveys on Montana refuges: 1998-1999. Montana Natural Heritage Program, Helena, MT. 22pp. Hendricks, P. and J.D. Reichel. 1998. Amphibian and reptile survey on Montana refuges: 1996. Montana Natural Heritage Program, Helena, MT. 19 p.
Hendricks, P. and J.D. Reichel. 1996. Preliminary amphibian and reptile survey of the Ashland District, Custer National Forest: 1995. Montana Natural Heritage Program, Helena, MT. 79 p.
Hendricks, P. and M. Roedel. 2001. A faunal survey of the Centennial Valley Sandhills, Beaverhead County, Montana. Report to the U.S. Bureau of Land Management and U.S. Fish and Wildlife Service. Montana Natural Heritage Program, Helena, MT. 44 pp. Hill, S.R. 1995. Migratory chronology of adult tiger salamanders (Ambystoma tigrinum) and survey of larvae of the tiger salamander in the northern range of Yellowstone National Park. Masters thesis, Montana State University. Bozeman, MT. 72 pp. Hill, S.R. and R.E. Moore. 1994. Herpetological survey in the northern range of Yellowstone National Park. Annual Report, Yellowstone National Park. February 1, 1994. 21 pp. Hill, S.R., Jr. and R.E. Moore. 1994a. Herpetological survey in the northern range of Yellowstone National Park. Investigator's Annual Reports Yellowstone National Park 1993. Yellowstone Center for Resources. pp. 96-97. Hoppe, D.M. and D. Pettus. 1974. Selection factors affcting dorsal color polymorphism in boreal chorus frogs. Journal of the Colorado-Wyoming Academy of Science 12(5): 73. Hoppe, D.M. and D. Pettus. 1984. Developmental features influencing color polymorphism in chorus frogs. Journal of Herpetology 18: 113-120. Hossack, B. and K.J. Yale. 2002. Geographic Distribution. Pseudacris maculata. Herpetological Review 33(1): 63. Hossack, B. and P.S. Corn. 2001. Amphibian survey of Medicine Lake National Wildlife Refuge Complex: 2001. USGS Northern Rocky Mountain Science Center, Aldo Leopold Wilderness Research Institute, Missoula, MT. 13 p.
Humphris, Michael., 1993, Wildlife Monitoring Report. Spring Creek Coal Company 1993 Mining Annual Report. Appendix I. April 11, 1993. Humphris, Michael., 1994, Wildlife Monitoring Report. Spring Creek Coal Company 1994 Mining Annual Report. Appendix I. April 1994. Jacobs, D. 1950. Pseudacris nigrita triseriata on the north shore of Lake Superior. Copeia 1950(2): 154. Jean, C., P. Hendricks, M. Jones, S. Cooper, and J. Carlson. 2002. Ecological communities on the Red Rock Lakes National Wildlife Refuge: inventory and review of aspen and wetland systems. Report to Red Rock Lakes National Wildlife Refuge. Kiesecker, J. 1996. pH mediated predator-prey interactions between Ambystoma tigrinum and Pseudacris triseriata. Ecological Applications 6(4): 1325-1331. Koch, E.D. and C.R. Peterson. 1989. A preliminary survey of the distribution of amphibians and reptiles in Yellowstone National Park. pp. 47-49. In: Rare, sensitive and threatened species of the Greater Yellowstone Ecosystem, T.W. Clark, A.H. Harvey, R.D. Dorn, D.C. Genter, and C. Groves (eds. ), Northern Rockies Conservation Cooperative , Montana Natural Heritage Program, The Nature Conservancy, and Mountain West Environmental Services. 153 p.
Koch, E.D. and C.R. Peterson. 1995. Amphibians and reptiles of Yellowstone and Grand Teton national parks. University of Utah Press, Salt Lake City, UT. 188 p.
L. L. C. Jones, W. P. Leonard and D. H. Olson, eds. 2005. Amphibians of the Pacific Northwest. Seattle Audubon Society: Seattle, WA, 227 pp. Land & Water Consulting, Inc., Missoula, MT., 2002, Montana Dept. of Transportation Wetland Mitigation Monitoring Report, Year 2001: Beaverhead Gateway, Dillon, Montana. Proj. No. 130091.011. July 2002. In 2001 Wetland Mitigation Monitoring Reports, Vol. I. Land & Water Consulting, Inc., Missoula, MT., 2002, Montana Dept. of Transportation Wetland Mitigation Monitoring Report, Year 2001: Big Spring Creek, Lewistown, Montana. Proj. No. 130091.029. July 2002. In 2001 Wetland Mitigation Monitoring Reports, Vol. I. Land & Water Consulting, Inc., Missoula, MT., 2002, Montana Dept. of Transportation Wetland Mitigation Monitoring Report, Year 2001: Fourchette Creek Reservoir Complex, Phillips County, Montana. Proj. No. 130091.023. July 2002. In 2001 Wetland Mitigation Monitoring Reports, Vol. I. Land & Water Consulting, Inc., Missoula, MT., 2002, Montana Dept. of Transportation Wetland Mitigation Monitoring Report, Year 2002: Big Spring Creek, Lewistown, Montana. Proj. No. 130091.029. February 2003. In 2002 Wetland Mitigation Monitoring Reports, Vol. I. Land & Water Consulting, Inc., Missoula, MT., 2002, Montana Dept. of Transportation Wetland Mitigation Monitoring Report, Year 2002: Fourchette Creek Reservoir Complex, Phillips County, Montana. Proj. No. 130091.023. February 2003. In 2002 Wetland Mitigation Monitoring Reports, Vol. I.
Lynch, C. 2000. 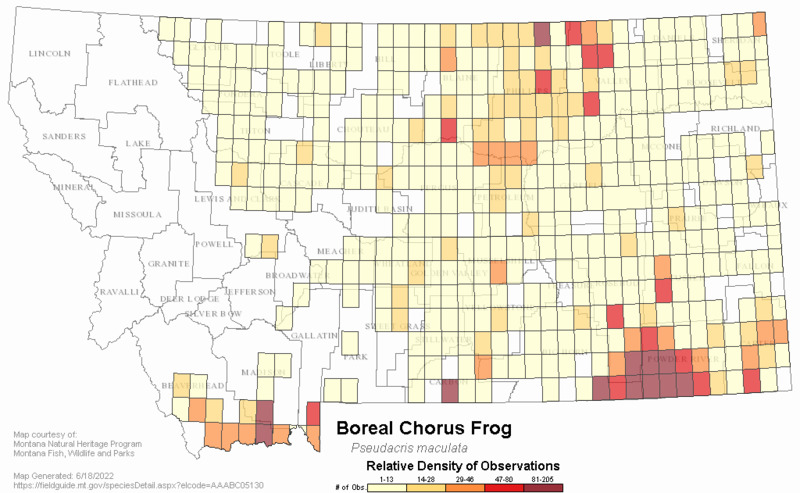 North American Amphibian Monitoring Program's Montana frog-call survey: a report on a pilot program in south-central Montana started April 2000 and completed in June 2000. Zoo Montana Conservation Through Education Program, Billings MT. 39 p.
Lynch, C. 2001. North American Amphibian Monitoring Program's Montana frog-call survey: report on year two of a program in south-central Montana started April 2001 and completed in June 2001. Zoo Montana Conservation Through Education Program, Billings MT. 12 p.
Lynch, Catherine. 2000. North American Amphibian Monitoring Program's Montana Frog-call Survey, a report on a pilot program in south-central Montana started April, 2000 and completed in June 2000. 36 pp (unnumbered). MacArthur, D.L. and J.W.T. Dandy. 1982. Physiological aspects of overwintering in the boreal chorus frog (Pseudacris triseriata maculata). Comparative Biochemistry and Physiology 72A:137-141. Mackessy, S.P., R. Donoho, J. Hobert, C. Montgomery and K. Waldron. 1996. Pseudacris triseriata maculata (boreal chorus frog). Herpetological Review 27(1): 30. Martin, P.R. 1980a. Terrestrial wildlife habitat inventory in southeastern Montana. Montana Department of Fish, Wildlife and Parks and Bureau of Land Management, Helena MT. 114 p.
Martin, P.R., K. Dubois and H.B. Youmans. 1981. Terrestrial wildlife inventory in selected coal areas, Powder River resources area final report. Montana Department of Fish, Wildlife and Parks and Bureau of Land Management, Helena, MT. No. YA-553-CTO- 24. 288 p.
Matthews, W.L. 1979. Wibaux-Beach wildlife baseline study - nongame species. Bureau of Land Management, Miles City, MT. 93 p.
Matthews, W.L. 1980b. Wildlife of Prairie County Terry study area. Bureau of Land Management, Miles City, MT. 52 p.
Matthews, W.L. 1981. Broadus-Pumpkin Creek baseline inventory - wildlife. Bureau of Land Management, Miles City, MT. 83 p.
Matthews, W.L. 1982. Bloomfield-North Fork Baseline Inventories - Wildlife. Unpublished report to the Bureau of Land Management, Miles City, Montana. 61 pp. Maxell, B. A. 2000. Management of Montana's amphibians: a review of factors that may present a risk to population viability and accounts on the identification, distribution, taxonomy, habitat use, natural history, and the status and conservation of individual species. Report to USFS Region 1, Order Number 43-0343-0-0224. University of Montana, Wildlife Biology Program. Missoula, MT. 161 p.
Maxell, B.A., J.K. Werner, P. Hendricks, and D.L. Flath. 2003. Herpetology in Montana: a history, status summary, checklists, dichotomous keys, accounts for native, potentially native, and exotic species, and indexed bibliography. Society for Northwestern Vertebrate Biology, Northwest Fauna Number 5. Olympia, WA. 135 p.
Maxim Technologies, Inc., 2002, Western Energy Company Rosebud Mine, Colstrip, Montana: 2002 Annual Wildlife Monitoring Report; December 1, 2001 - November 30, 2002. Febr. 24, 2002. McDonald, M. 1982. Terrestrial wildlife inventory, Dominy Project area, July, 1979 - June, 1981. Draft Tech. Rep. for Western Energy Co. by Westech, Helena, MT. McEneaney, T. and J. Jensen. 1974. The reptiles and amphibians of the Charles M. Russell National Wildlife Range - 1974. Charles M. Russell National Wildlife Refuge. Lewistown, MT. 3 p.
Moore, J.E. and E.H. Strickland. 1954. Notes on the food of three species of Alberta amphibians. American Midland Naturalist 52: 221-224. Muths, E., D.H. Campbell, and P.S. Corn. 2003. Hatching success in salamanders and chorus frogs at two sites in Colordao, USA: effects of acidic deposition and climate. Amphibia-Reptilia 24(1):27-36. OEA Research. 1985. Wildlife Inventory:Monitoring Report for the CX Ranch Project. 1983-1984. Unpublished report for Consolidation Coal Company, Pittsburgh, Pennsylvania. Patla, D.A. 1997. Changes in a population of spotted frogs in Yellowstone National Park between 1953 and 1995: the effects of habitat modification. Ph.D. dissertation, Idaho State University, Pocatello. Patla, D.A. 1997b. Potential impacts to amphibians and reptiles from the proposed Canyon contractor camp. 10 May 1997 (Supplement, 12 January 1998). Greater Yellowstone Ecosystem Amphibian Survey and Monitoring Program, Herpetology Laboratory, Department of Biological Sciences, Idaho State University, Pocatello, ID. 16 p.
Patla, D.A. 1998. Potential effects of native fish restoration projects on amphibians in Yellowstone National Park Part I. Report to National Park Service, Yellowstone National Park. 20 November 1998. 26 pp. Patla, D.A. 1998a. Amphibians and reptiles in the Old Faithful sewage treatment area. Report to Yellowstone Center for Resources, Yellowstone National Park. 10 September, 1998. Greater Yellowstone Ecosystem Amphibian Survey and Monitoring Program, Herpetology Laboratory, Department of Biological Sciences, Idaho State University, Pocatello, ID. 7 p.
Patla, D.A. 1999a. Amphibians and reptiles along the grand loop road in Yellowstone National Park: Canyon Junction to Fishing Bridge Junction. December 11, 1999. Greater Yellowstone Ecosystem Amphibian Survey and Monitoring Program, Herpetology Laboratory, Department of Biological Sciences, Idaho State University, Pocatello, ID. 24 p.
Patla, D.A. 1999b. Amphibians and reptiles of the Madison to Norris road improvement project area, Yellowstone National Park. 11 November, 1999. Greater Yellowstone Ecosystem Amphibian Survey and Monitoring Program, Herpetology Laboratory, Department of Biological Sciences, Idaho State University, Pocatello, ID. 17 p.
Patla, D.A. 1999c. Amphibians and reptiles, Tower Junction to Canyon Village, Yellowstone National Park; addendum to previous report. 24 November, 1999. Greater Yellowstone Ecosystem Amphibian Survey and Monitoring Program, Herpetology Laboratory, Department of Biological Sciences, Idaho State University, Pocatello, ID. 10 p.
Patla, D.A. 2000. Amphibians in potential native fish restoration areas, Yellowstone National Park Part II. 7 March, 2000. Greater Yellowstone Ecosystem Amphibian Survey and Monitoring Program, Herpetology Laboratory, Department of Biological Sciences, Idaho State University, Pocatello, ID. 22 p.
Patla, D.A. and C.R. Peterson. 1996a. Amphibians and reptiles along the Grand Loop Highway in Yellowstone National Park: Tower Junction to Canyon Village. 24 February, 1996. Greater Yellowstone Ecosystem Amphibian Survey and Monitoring Program, Herpetology Laboratory, Department of Biological Sciences, Idaho State University, Pocatello, ID. 49 p.
Patla, D.A. and C.R. Peterson. 1996b. Amphibians and reptiles along the Grand Loop Highway in Yellowstone National Park: Arnica Creek to Little Thumb Creek. 1 August, 1996. Greater Yellowstone Ecosystem Amphibian Survey and Monitoring Program, Herpetology Laboratory, Department of Biological Sciences, Idaho State University, Pocatello, ID. 35 p.
Patla, D.A. and C.R. Peterson. 1997. Amphibians and reptiles along the Grand Loop Highway in Yellowstone National Park: Mammoth Hot Springs to Norris Junction. 1 February, 1997. Greater Yellowstone Ecosystem Amphibian Survey and Monitoring Program, Herpetology Laboratory, Department of Biological Sciences, Idaho State University, Pocatello, ID. 60 p.
Patla, D.A. and C.R. Peterson. 1998. Amphibians of the Greater Yellowstone Ecosystem. Natural Resource Conservation Cooperative News 11(Autumn 1998): 10-11. Patla, D.A. and C.R. Peterson. 1999. Are amphibians declining in Yellowstone National Park? Yellowstone Science 1999 (Winter):2-11. Patla, D.A. and C.R. Peterson. 2001. Status and trends of amphibian populations in the Greater Yellowstone Ecosystem, progress report, February 2001. Greater Yellowstone Ecosystem Amphibian Survey and Monitoring Program, Herpetology Laboratory, Department of Biological Sciences, Idaho State University, Pocatello, ID. 8 p.
Peterson, C.R. and J.P. Shive. 2002. Herpetological survey of southcentral Idaho. Idaho Bureau of Land Management Technical Bulletin 02-3:1-97. Peterson, C.R., C.J. Askey, and D.A. Patla. 1993. Amphibians and reptiles along the Grand Loop and Fountain Freight Roads between Madison Junction and Biscuit Basin in Yellowstone National Park. 26 July, 1993. Greater Yellowstone Ecosystem Amphibian Survey and Monitoring Program, Herpetology Laboratory, Department of Biological Sciences, Idaho State University, Pocatello, ID. 45 p.
Peterson, C.R., D.A. Patla, and S.R. Sullivan. 1995. Amphibians and reptiles along the Grand Loop Highway in Yellowstone National Park: Madison Junction to Norris Campground. 7 July, 1995. Greater Yellowstone Ecosystem Amphibian Survey and Monitoring Program, Herpetology Laboratory, Department of Biological Sciences, Idaho State University, Pocatello, ID. 64 p.
Peterson, C.R., E.D. Koch and P.S. Corn. 1992. Monitoring amphibian populations in Yellowstone and Grand Teton National Parks final report to University of Wyoming. National Park Service Research Center, Laramie, WY. 37 p.
Platz, J. E. 1989. Speciation within the chorus frog Pseudacris triseriata: morphometric and mating call analyses of the boreal and western subspecies. Copeia 1989:704-712. Platz, J.E. and A. Lathrop. 1993. Body size and age assessment among advertising male chorus frogs. Journal of Herpetology 27(1): 109-111. Platz, J.E. and D.C. Forester. 1988. 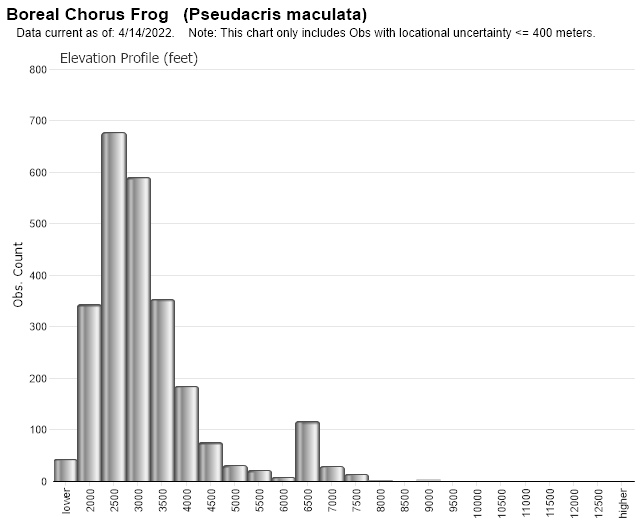 Geographic variation in mating call among the four subspecies of the chorus frog: Pseudacris triseriata (Wied). Copeia 1988(4): 1062-1066. Powder River Eagle Studies, Inc., Gillette, WY., 1995, Spring Creek Mine 1994 Wildlife Monitoring Studies. 4/94 to 4/95. Spring Creek Coal Company 1995 Mining Annual Report. Appendix I. May 1995. Powder River Eagle Studies, Inc., Gillette, WY., 1996, Spring Creek Mine 1995 Wildlife Monitoring Studies. Spring Creek Coal Company 1995-1996 Mining Annual Report. Vol. I, App. I. May 1996. Powder River Eagle Studies, Inc., Gillette, WY., 1997, Spring Creek Mine 1996 Wildlife Monitoring Studies. February 1997. Powder River Eagle Studies, Inc., Gillette, WY., 1999, Spring Creek Mine 1998 Wildlife Monitoring. March 1999. Powder River Eagle Studies, Inc., Gillette, WY., 2000, Spring Creek Mine 1999 Wildlife Monitoring. March 2000. Powder River Eagle Studies, Inc., Gillette, WY., 2000, Spring Creek Mine 2000 Wildlife Monitoring. March 2000. Rauscher, R.L. 1998. Amphibian and reptile survey on selected Montana Bureau of Reclamation impoundments. Montana Department of Fish, Wildlife and Parks, Nongame Program. Bozeman, MT. 24 pp. Rauscher, R.L. 2000. Amphibian and reptile survey on selected Montana Bureau of Reclamation impoundments. Unpublished report, Montana Fish, Wildlife & Parks Non-game Program. 12 pp + maps, tables. Reichel, J. and D. Flath. 1995. Identification of Montana's amphibians and reptiles. Montana Outdoors 26(3):15-34. Reichel, J. D. In prep. Amphibian and reptile survey in southwest Montana: 1996. Unpublished report. Reichel, J. D. In prep. Amphibian and reptile survey of USFWS lands in north-central Montana: 1996. Unpublished report. Reichel, J.D. 1996. Preliminary amphibian and reptile survey of the Helena National Forest: 1995. Montana Natural Heritage Program. Helena, MT. 87 pp. Reichel, J.D. 1997. Amphibian, reptile and northern bog lemming survey on the Rocky Mountain Front: 1996. Montana Natural Heritage Program, Helena, MT. 81 p.
Reichel, J.D. 1995. Preliminary amphibian and reptile survey of the Lewis and Clark National Forest: 1994. Montana Natural Heritage Program. Helena, MT. 92 p.
Reichel, J.D. 1995. Preliminary amphibian and reptile survey of the Sioux District of the Custer National Forest: 1994. Montana Natural Heritage Program, Helena, MT. 75 p.
Reichel, J.D. 1997. Amphibian and reptile survey in northcentral Montana on the Lewistown District, BLM. Unpublished report. Roberts, W. and V. Lewin. 1979. 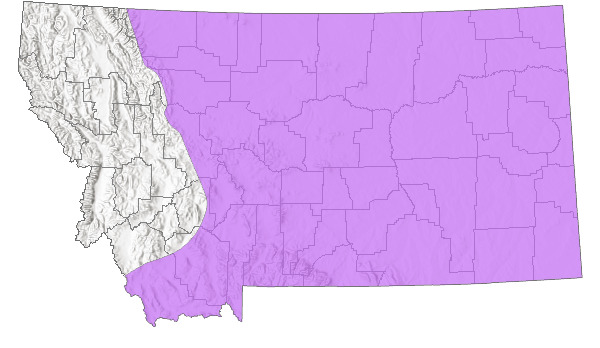 Habitat utilization and population densities of the amphibians of northeastern Alberta. Canadian Field Naturalist 93(2): 144-154. Roedel, M.D. and P. Hendricks. 1998. Amphibian and reptile survey on the Bureau of Land Management Lewistown District: 1995-1998. Montana Natural Heritage Program, Helena, MT. 53 p.
Roedel, M.D. and P. Hendricks. 1998b. Amphibian and reptile inventory on the Headwaters and Dillon Resource Areas in conjunction with Red Rocks Lakes National Wildlife Refuge: 1996-1998. Montana Natural Heritage Program, Helena, MT. 46 p.
Russell, A. P. and A. M. Bauer. 1993. The amphibians and reptiles of Alberta. University of Calgary Press. Calgary, Alberta. 264 p.
Scow, K.L. 1980. Terrestrial wildlife survey American Colloid study area Phillips County, Montana. Western Technology and Engineering, Inc., Helena, MT. Sestrich, C. 2004. Hebgen Reservoir amphibian survey. USDA Forest Service Annual Progress Report to PPL Montana. 22pp. Sestrich, Clint. 2006. 2006 Hebgen Reservoir Amphibian Survey, USDA Forest Service Annual Progress Report to PPL Montana. Hebgen Lake Ranger District. Gallatin National Forest. West Yellowstone Montana. Skinner, M.P. 1924. The Yellowstone Nature Book. A.C. McClurg Company, Chicago, IL. 221 p.
Smith, P.W. 1956. 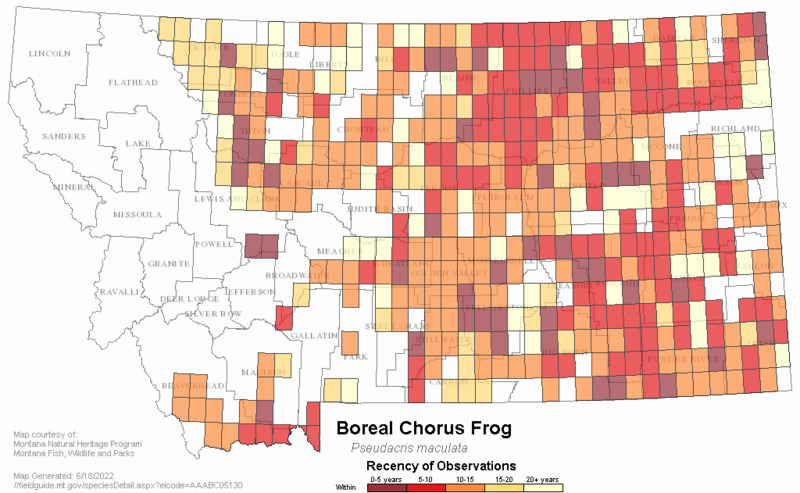 The status, correct name, and geographic range of the boreal chorus frog. Proceedings of the Biological Society of Washington 69: 169-176. Spring Creek Coal Company., 1992, Wildlife Monitoring Report. Spring Creek Coal Company 1992 Mining Annual Report. Appendix I.
Stebbins, R. C. 2003. A field guide to western reptiles and amphibians. 3rd Edition. Houghton Mifflin Company, Boston and New York. 533 p.
Sullivan, S.R. and C.R. Peterson. 1996. Amphibians and reptiles along the highway in Yellowstone National Park: Tower Junction to the Northeast Entrance. 25 February, 1996. Greater Yellowstone Ecosystem Amphibian Survey and Monitoring Program, Herpetology Laboratory, Department of Biological Sciences, Idaho State University, Pocatello, ID. 60 p.
Thompson, L.S. 1981. Circle West wildlife monitoring study: Third annual report. Technical report No. 8. Montana Department of Natural Resources and Conservation. Helena, Montana. Thompson, L.S. 1982. Circle West Wildlife Monitoring Study. Fourth annual report. Technical report 10. Montana Department of Natural Resources and Conservation, Helena, Montana. Timken, R. No Date. Amphibians and reptiles of the Beaverhead National Forest. Western Montana College, Dillon, MT. 16 p.
Tordoff, W., III. 1969. Gene frequency differences among semi-isolated proximate populations of chorus forgs (Pseudacris). Journal of Herpetology 3: 194. Tordoff, W., III. 1980. Selective predation of gray jays (Perisoreus canadensis) upon boreal chorus frogs (Pseudacris triseriata). Evolution 34(5): 1004-1008. Tordoff, W., III., and D. Pettus. 1977. Temporal stability of phenotypic frequencies in Pseudacris triseriata (Amphibia, Anura, Hylidae). Journal of Herpetology 11(2): 161-168. Turner, F.B. 1951. A checklist of the reptiles and amphibians of Yellowstone National Park with incidental notes. Yellowstone Nature Notes 25(3): 25-29. Turner, F.B. 1952a. Peculiar aggregations of toadlets on Alum Creek. Yellowstone Nature Notes 26(5): 57-58. Turner, F.B. 1955. Reptiles and amphibians of Yellowstone National Park. Yellowstone Interpretive Series No. 5. Yellowstone Library and Museum Association. Yellowstone National Park, WY. 40 p.
Turner, F.B. 1957. The ecology and morphology of Rana pretiosa pretiosa in Yellowstone Park, Wyoming. Ph.D. dissertation, University of California. Berkeley, CA. 252 pp. Turner, F.B. 1960. Population structure and dynamics of the western spotted frog, Rana pretiosa pretiosa Baird & Girard, in Yellowstone Park, Wyoming. Ecol. Monogr. 30(3): 251-278. Van Kirk, R., L. Benjamin, and D. Patla. 2000. Riparian area assessment and amphibian status in the watersheds of the Greater Yellowstone Ecosystem. Greater Yellowstone Coalition, Bozeman, MT. 102 p.
Vitt, L.J., J.P. Caldwell, and D.B. Shepard. 2005. Inventory of amphibians and reptiles in the Billings Field Office Region, Montana. Sam Noble Oklahoma Museum of Natural History and Department of Zoology, University of Oklahoma, Norman, OK. 33 pp. VTN Colorado, Inc. Decker Coal Company., 1975, Draft environmental impact assessment for the proposed North Extension of the West Decker Mine. Waage, B.C. 1998. Western Energy Company Rosebud Mine 1997 annual wildlife monitoring report December 1, 1996 to November 30, 1997 survey period. Western Energy Company, Colstrip, MT. Waage, Bruce C., 1993, Western Energy Company Rosebud Mine, Colstrip, Montana: Annual Wildlife Monitoring Report; 1993 Field Season. April 1993. Waage, Bruce C., 1995, Western Energy Company Rosebud Mine, Colstrip, Montana:1994 Annual Wildlife Monitoring Report; December 1, 1993 - November 30, 1994. February 27, 1995. Waage, Bruce C., 1996, Western Energy Company Rosebud Mine, Colstrip, Montana: 1995 Annual Wildlife Monitoring Report; December 1, 1994 - November 30, 1995. February 28, 1996. Waage, Bruce C., 1998, Western Energy Company Rosebud Mine, Colstrip, Montana: 1997 Annual Wildlife Monitoring Report; December 1, 1996 - November 30, 1997 Survey Period. March 23, 1998. Waage, Bruce C., 1999, Western Energy Company Rosebud Mine, Colstrip, Montana: 1998 Annual Wildlife Monitoring Report; December 1, 1997 - November 30, 1998 Survey Period. February 24, 1999. Waage, Bruce C., 2000, Western Energy Company Rosebud Mine, Colstrip, Montana: 1999 Annual Wildlife Monitoring Report; December 1, 1998 - November 30, 1999. February 2000. Waage, Bruce C., 2001, Western Energy Company Rosebud Mine, Colstrip, Montana: 2000 Annual Wildlife Monitoring Report; December 1, 1999 - November 30, 2000. March 30, 2001. Waage, Bruce C., 2002, Western Energy Company Rosebud Mine, Colstrip, Montana. 2001 Annual Wildlife Monitoring Report; December 1, 2000 - November 30, 2001. Febr. 26, 2002. Werner, J.K., B.A. Maxell, P. Hendricks and D.L. Flath. 2004. Amphibians and Reptiles of Montana. Mountain Press Publishing Company: Missoula, MT. 262 pp. Western Technology and Engineering, Inc. (WESTECH). 1994. Wildlife Monitoring Absaloka Mine Area Annual Report, 1993. Montana SMP 85005. OSMP Montana 0007c. Mar. 12, 1994. Western Technology and Engineering, Inc. (WESTECH)., 1991, Wildlife Monitoring and Additional Baseline Inventory: Absaloka Mine Area Annual Report, 1991. Montana SMP 85005 R1. OSMP Montana 0007B. Febr. 25, 1991. Western Technology and Engineering, Inc. (WESTECH)., 1996, Wildlife Monitoring Absaloka Mine Area Annual Report, 1995. Montana SMP 85005. OSMP Montana 0007D. Febr. 23, 1996. Western Technology and Engineering, Inc. (WESTECH)., 1997, Wildlife Monitoring Absaloka Mine Area Annual Report, 1996. Montana SMP 85005. OSMP Montana 0007D. Mar. 1997. Western Technology and Engineering, Inc. (WESTECH)., 1999, Wildlife Monitoring Absaloka Mine Area Annual Report, 1998. SMP 85005. OSMP Montana 0007E. April 1999. Western Technology and Engineering, Inc. (WESTECH)., 2000, Wildlife Monitoring Absaloka Mine Area Annual Report, 1999. Montana SMP 85005. OSMP Montana 0007E. February 2000. Western Technology and Engineering, Inc. (WESTECH)., 2001, Wildlife Monitoring Absaloka Mine Area Annual Report, 2000. Montana SMP 85005. OSMP Montana 0007E. February 2001. Wheeler, G.C. and J. Wheeler. 1966. The amphibians and reptiles of North Dakota. University of North Dakota, Grand Forks, ND. 104 pp. Wied, M.P. 1843. Travels in the interior of North America by Maximilian, Prince of Wied. With numerous engravings on wood, and a large map. Translated from the German by H. Evans Lloyd. To accompany the original series of eighty-one elaborately-coloured plates. Size, imperial folio. Ackerman and Co., London, England. 520 p.
Wied, M.P. 1865. Verzeichniss der reptilien, welche auf einer reise in nordlichen America beobachtet wurden, von Maximilian, Prinzen zu Wied. Eigengangen bei der Akademie am 1, Juni 1865. Druck von E. Blochmann und Sohn, Dresden, Germany. 141 p.
Web Search Engines for Articles on "Boreal Chorus Frog"
Additional Sources of Information Related to "Amphibians"